There are a variety of extreme quad biking sports practiced by adrenalin junkies throughout the UK. One of the most popular extreme quad biking sports in the UK is quad cross, a take on motocross but with four-wheeled bikes. Other major extreme quad biking sports include beach cross and endurance sports such as cross-country and enduro that mix technical skill during hairy long-distance runs. 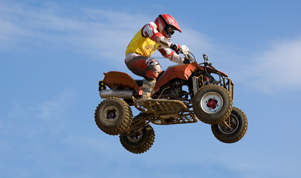 Quad bikes feature four wheels and, according to UK laws, have a mass of less than 550 kilograms. The first powered quad bike in the UK was built by Royal Enfeld in Redditch, Worcestershire. Modern quads emerged in the 1970s and were originally manufactured by Honda based on their motorbike designs. In order to operate a quad bike on public roads, riders must carry a valid B1 licence and meet all insurance, registration and tax requirements. Quads or quad bikes are also known as four-wheelers and all-terrain vehicles or ATVs, particularly in North America. Racing or sport quad bike models are built for performance. Rather than have utility in mind, these quad bikes are designed for trail riding and racing. They are typically lightweight models with high powered engines. These quads generally feature good suspension and a low centre of gravity to assist with maneuvering and speed performance. Sport or racing quads are often modified for specific types of extreme quad biking, including quad cross, cross-country, desert racing, speedway and drag racing, beach cross, and hill climbing. Quad cross is gaining popularity in the UK and the United States. Similar to motocross, this type of extreme quad biking is done on trials and off-road circuits. Also known as quadcross or quad X, quad cross is organised on a circuit that incorporates different types of terrain such as dirt roads and wooded trails. A circuit may also include obstacles including river and log crossings, as well as hill climbs. The Auto Cycle Union (ACU) organises the annual British Quad Cross Championship on circuits across the UK. Events in 2013 were held in Milton Park, Asham Woods, Wooley Grange, Grittenham and Canada Heights. Races are generally organised between April and October. The MC Federation also sanctions motorcycle events in the UK, including quad bike competitions. The QMS Nationals is a sanctioned British Championship for quad cross. Quad races, as well as sidecar and solo motorbike competitions, are run between April and August. The DWT Nora MX Quad Racing Championship features 16 youth and adult competition classes, from novice to professional. All venues are situated in Central England and are within a two-hour drive of Oxford. A typical race day includes a practice or qualifying run and three races. Recognised by the ACU, the championship generally runs from March to October and is sponsored by the Nora MX Quad Club in Oxford. Beach cross is a quad bike competition on a circuit or course laid out on a beach. To increase difficulty, circuits typically integrate artificial jumps and sand dunes. Races are normally held on short courses of between one to three miles, with a race lasting for one to three hours. Beach cross can be very demanding on machines, which are often damaged by sand during a race. Maintenance is therefore top of mind for beach cross enthusiasts and competitors. In addition to motorbike races, the RHL Weston Beach Race in Weston-super-Mare includes quad bike races. It is the most popular beach cross event in the UK and generally attracts approximately 100,000 spectators. Quad classes include solo, two-man, 4x4, and youth classes. Each adult quad race attracts up to 500 starters from around the world, with youth quad races featuring up to 150 riders. Held in October and sanctioned by the ACU, the historic event has been held since the early 1980s and is run on a three-mile dune course. First held in 2010, the Skegness Beach Race attracts some 25,000 fans to East Lindsey in Lincolnshire. Organised in November by the Amateur Motor Cycle Association (AMCA), the two-day event attracts over 260 motocross and quad cross competitors. Another major beach cross event is the Weymouth Beach X, which brings together various expert, novice, youth and senior competitors. Races include 50cc to 700cc quad bikes ridden by competitors aged 8 and up. The competition is typically held in February along the scenic Dorset Coastline. Also a popular motorcycle sport, enduro is a technical and endurance quad bike sport that incorporates obstacles and challenges. Competitors must arrive at pre-determined locations at given times, with penalties applied when a rider does not meet defined times. A similar long-distance quad bike sport is cross-country, although races cover much longer distances than enduro. Often stretching hundreds of kilometres, cross-country events take place over several days on largely off-road courses. The world's most famous cross-country race is the Dakar Rally, which also welcomes quad bikes. Quad Fest at Garlands Moor near Oakhampton in Devon features youth and adult competitions in quad bike enduro racing. Team and Ironman races feature quad bikes with 125cc to 250cc engines. Traditionally held during a weekend in the spring or autumn, the laid-back event blends quad bike racing with music and camping. The event attracts both quad cross and enduro specialists, with the circuit integrating wide tracks, challenging jumps and long corners. Held during the summer, Endurofest showcases enduro racing, as well as quad, trail and motocross biking. The event takes place at Manor Farm in Adstone, Northamptonshire. Cross country and enduro races are organised in a variety of adult quad classes, including 250cc, 450cc, 660/700cc and 4x4. Youth and kids races are also run. Another major endurance event is the QRA Great 8 race, an eight-hour event organised by the Quad Racing Association (QRA) UK since 2005.